Looking for a New Toyota Land Cruiser in your area? CarGurus has 1,301 nationwide Toyota Land Cruiser dealers with 3,294 new car listings. The Toyota Land Cruiser, one of the oldest and largest so-called “land yachts” on the market, is a capable vehicle. Some shoppers might assume Toyota has little experience with luxury, but the Land Cruiser is an exception. It offers old-school luxury, rather than new. The 2019 Land Cruiser carries over with few changes from its most recent redesign in 2008 and refresh in 2016. The hulking Land Cruiser has a massive footprint, long and wide. Though the slab-like sides keep detail to a minimum, the Land Cruiser’s nose and tail add visual interest. A huge grille dominates the front end, flanked by LED lighting and topped by a sculpted hood. The rear features a split tailgate and chrome detailing. 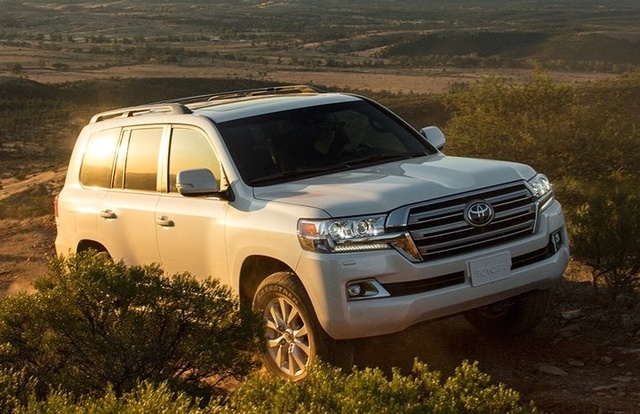 One powertrain is available in the Land Cruiser, but it should satisfy your needs. This 5.7-liter V8 engine produces 381 horsepower and 401 pound-feet of torque, and comes matched with an 8-speed automatic transmission. The Land Cruiser includes a full-time 4-wheel-drive (4WD) system, making it one of the most formidable off-roaders in the class. It boasts a tow rating of up to 8,100 pounds when properly equipped. With all that in mind, it should be no surprise that feeding the Land Cruiser will get pricey. EPA ratings come in at 13 mpg city, 18 highway, and 15 combined. The Land Cruiser’s cabin features a rugged look, well executed with upscale materials. Three rows of seating accommodate eight passengers. Adults will be comfortable in the first and second rows, but will probably find inadequate legroom in the back seats. The sole trim level includes a power moonroof, leather upholstery, heated and ventilated front seats, reclining and heated second-row seats, a heated steering wheel, remote keyless entry, push-button start, LED accent lights, wireless device charging, and a cooled center console. A rear-row entertainment system is the only standalone interior upgrade. A 9-inch touchscreen display hosts the easy-to-use Entune infotainment system. Features include a 14-speaker JBL audio system, CD player, AM/FM radio, SiriusXM satellite radio, HD Radio, iPod connectivity, Bluetooth, voice recognition, navigation, and Siri Eyes Free. Unlike many competing SUVs, the Land Cruiser does not include Apple CarPlay and Android Auto. The 2019 Land Cruiser has not been evaluated by the National Highway Traffic Safety Administration (NHTSA) or the Insurance Institute for Highway Safety (IIHS), but it includes plenty of safety features. You’ll get a reversing camera, a multi-terrain monitor with selectable views, front and rear parking sensors, blind-spot monitoring, rear cross-traffic alert, and trailer-sway control. The Toyota Safety Sense P package, also included, has automatic high beams, radar cruise control, lane-departure alert with sway warning, and pre-collision with pedestrian detection. The Safety Connect telematics system includes emergency assistance and automatic-collision notification. Don’t discount the Toyota Land Cruiser based on its age. If you are shopping for a large SUV with plenty of power and all-terrain capability, the Land Cruiser should be on your list. What's your take on the 2019 Toyota Land Cruiser? GuruT43JK Best ever. Goes anywhere. Lasts forever. I'm not sure what the argument is. Have you driven a 2019 Toyota Land Cruiser? Enter your zip to see incentives for a new Land Cruiser in your area. CarGurus has 1,353 nationwide Land Cruiser listings starting at $4,975.